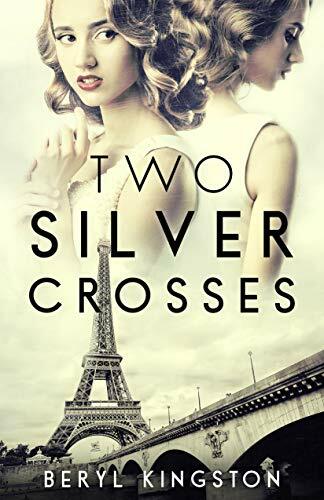 Over the moon to have my book review of Two Silver Crosses by Beryl Kingston today. Twins Ginny and Emily Holborn have everything they could ever need in their Wolverhampton home: a loving family, a garden to play in and a staff waiting to attend to their every need. Until, one summer day in 1926, they disappear without a trace. If you read the blog frequently you will know how excited I was about this release. I am a lifetime fan of Ms Beryl Kingston. I spent hours with her books as a teenager. So Two Silver Crosses coming across my path from Agora Books has most certainly been the highlight of my reading year. The book cover design is beautiful and timeless. It fits with perfection to the story and I have to say the paper and cover quality are the best I have ever seen. It is a whopper of a book at 590 pages. But I could have read another 590 it was/is that well written. It felt like something magically wonderfully stepping back inside the brain of Ms Kingston. Her unique ability to write the lives of these characters so gently and with care. Never rushing or over indulging in details. I was with the twins every step of the way, haunting them as the reader. Experiencing the pain and joys of each adventure alongside them. Crying and laughing with them. France is a huge part of the book and I really felt I was there. I could smell the streets and feel the vibrations that Emily felt. It was an adventure I never wanted to end. Beryl Kingston has a way of building up a particular scene into an oh no moment. When you as the reader can see the connotations of disaster ahead and you almost hold your breath too long and scream at the pages. It almost felt like my heart would pop from my chest with the rate it was thumping against my rib cage. As I read the last page I smiled and my heart glowed. What a beautiful experience this was indeed. I haven’t read a saga fiction novel since last year. I love them but most of all I really enjoy Beryl Kingston’s writing the most. I could pop down a 1000 + words about how amazing the writing is and explaining the quality and love that you can tell goes into every word on the page. Also the care and attention to every character even the horrid ones. It was perfect in every way, there is nothing more you could want from a book. Heart – warming, breaking and felt. Thank you so much to Agora Book for my gifted copy. Sent in exchange for an honest review in my own words. I am very very grateful, you have no idea that gift that you gave me.